Pinterest is full of these – and ours is a humble effort. But it only took an hour or so to put together, and gave us an afternoon of fun. Plus it is a temporary fixture, so can be changed, adapted, and ultimately removed. an empty juice bottle with lots of small holes made in the bottom for a “shower” effect. a bottle cut in half to make a long channel, like a drainpipe (I’ve seen guttering used to great effect in water play. The neck of a bottle sliced off to make a funnel. the lid of an ice cream tub to make a water slide. 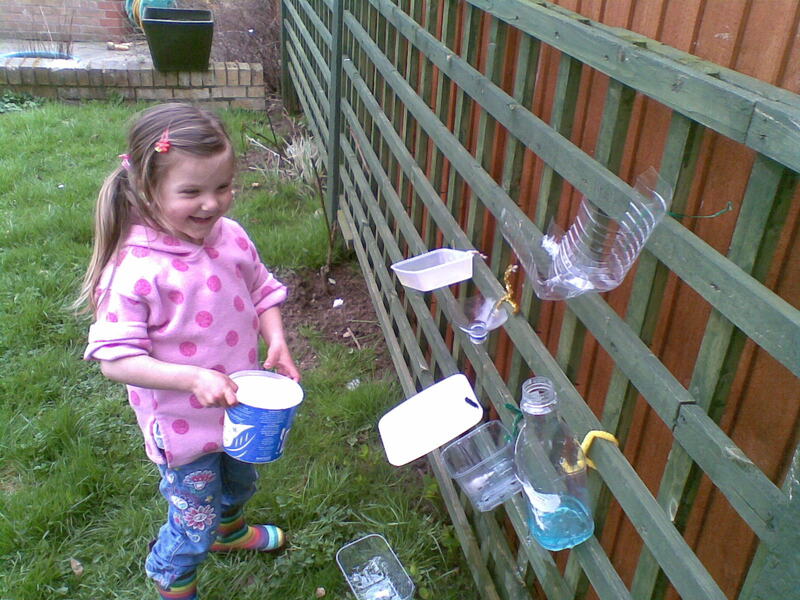 I gave L, N and F some containers for pouring, catching and carrying water, filled the water table with coloured water (with a drop of food colouring added), then set them free! 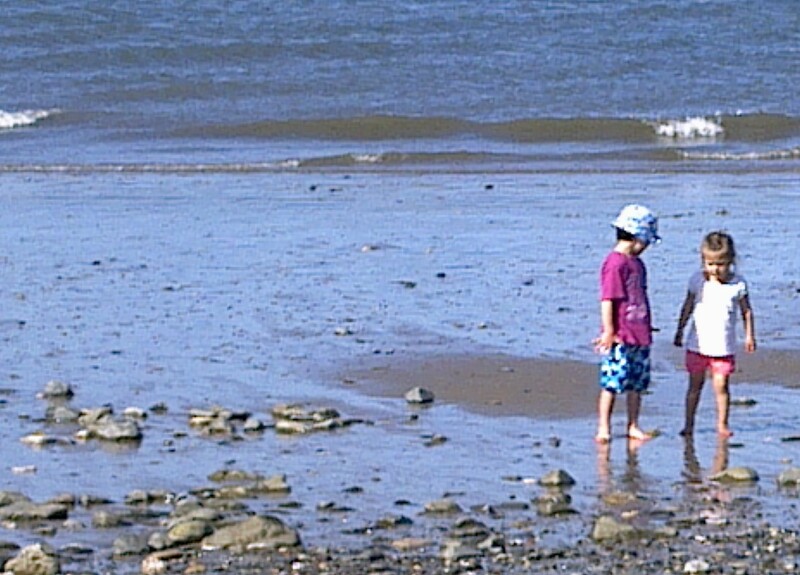 N’s cry of “Wow, this is fantastic Mummy!” made me feel this was going to be a success – and it was. L and N fetched and carried water, as part of a game involving feeding N’s very thirsty horses, in which she enlisted L’s help. 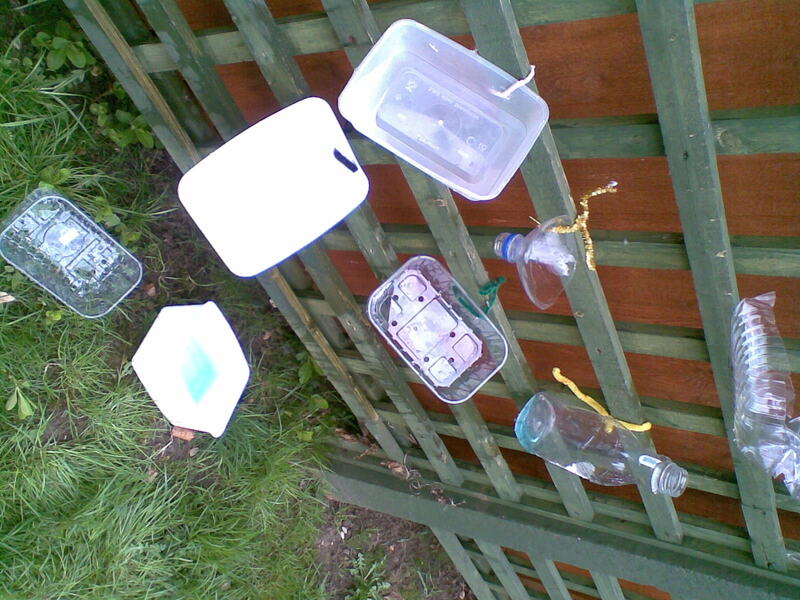 Whilst doing so, they were working out which containers carried the most water, pouring water from one to another and comparing capacity. They were both surprised when the tallest container didn’t hold the most water. They also experimented with how quickly the water would flow from different containers, and how to make it trickle from one to another, directing the flow of water in different directions, at different speeds – some very early physics was happening! 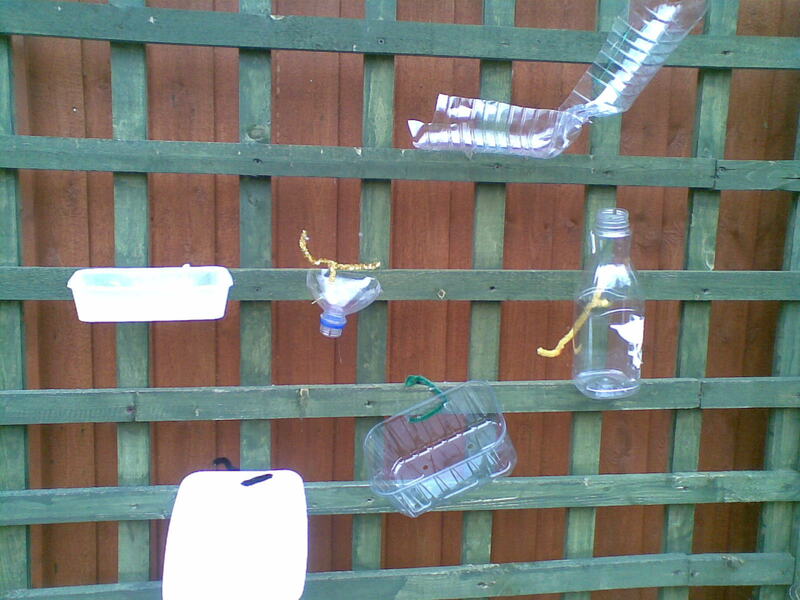 The great thing about using pipecleaners and trellis was that L and N could easily move things around the wall as they wished, allowing them to experiment more than would have been possible had the bottles been nailed to the wood. We used coloured water in blue, red and yellow, which reinforced colour mixing and allowed them to experiment with making “magic potions”, which included some leaves and twigs from the garden too. 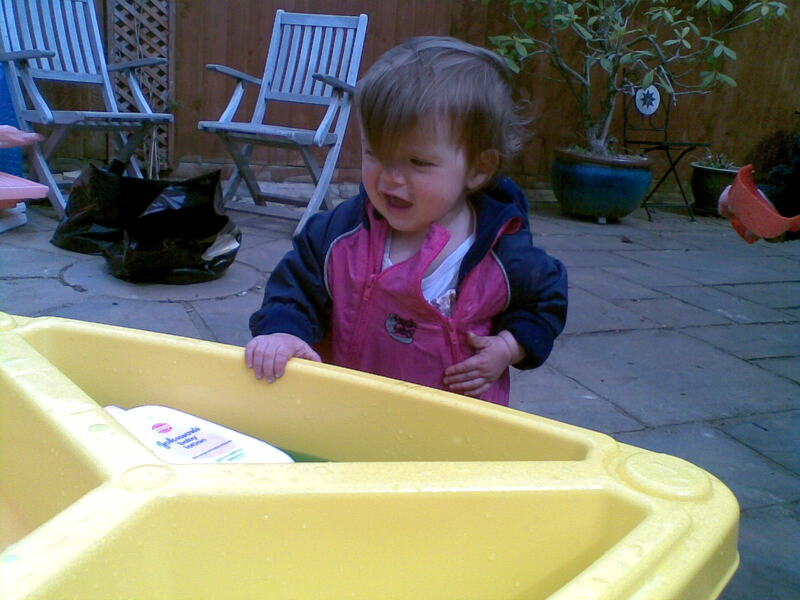 F enjoyed watching the water flowing, and also splashing in the coloured water in the water table (although I only managed to get a very grumpy looking picture!). 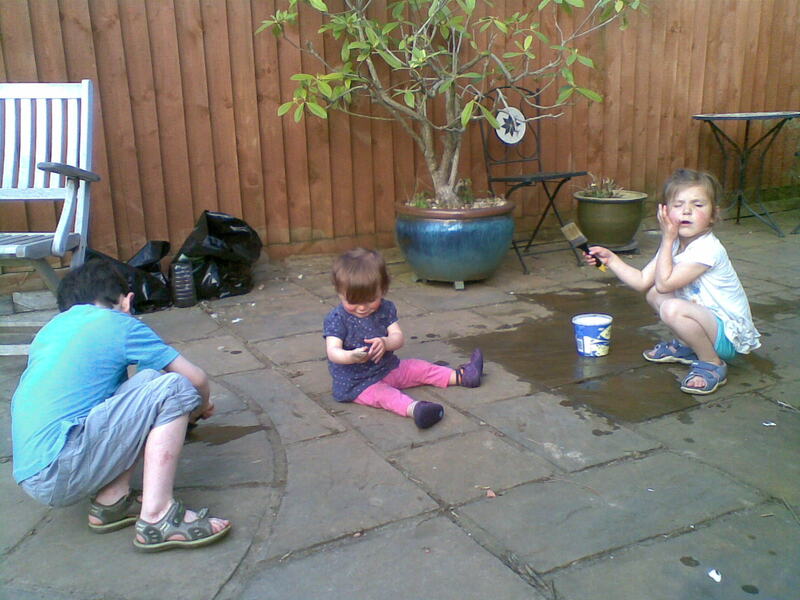 We also ended up “painting” with the water, which was hugely popular, and all three children could join in with – in fact, F loved it most of all and it was lovely not to have to mind where she “drew”! 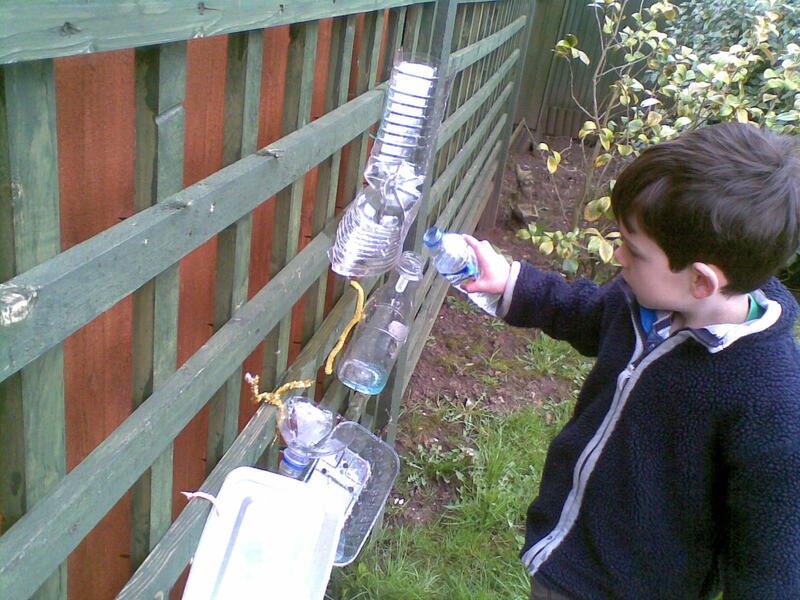 This entry was posted in Science and Discovery, Seasons, Sensory Play and tagged water play, water wall on April 24, 2013 by Kate Carre.